A very nice artwork where you can see clearly what you are given. It is realistic and welldone, but the men seem a bit "plastic", lifeless, they don't seem they are in combat. 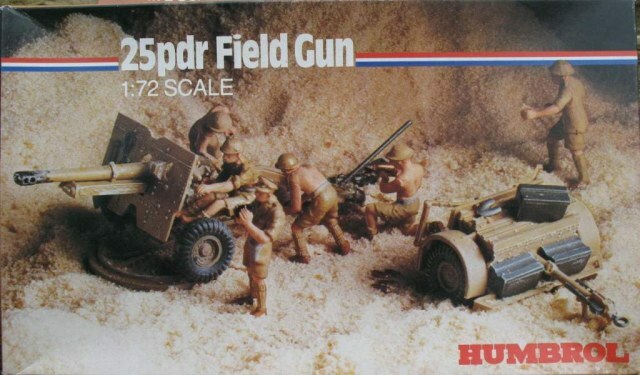 The vehicle and the cannon is superbly done, but the men seem wax statues. 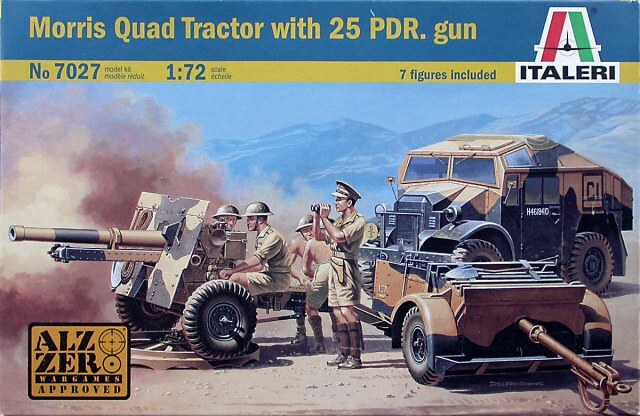 This model is really two Esci models into one box, the 25 PDR gun and the Morris quad. The original box, nice and realistic. A Revell reissue, with a nice background. Later Esci decided to give a background to all their boxes, and this maybe looks a bit strange, as it looks like France more than the desert, I suppose it represents Italy. And later, Esci thought that the white background was better, so back again the white and now with a different artwork. 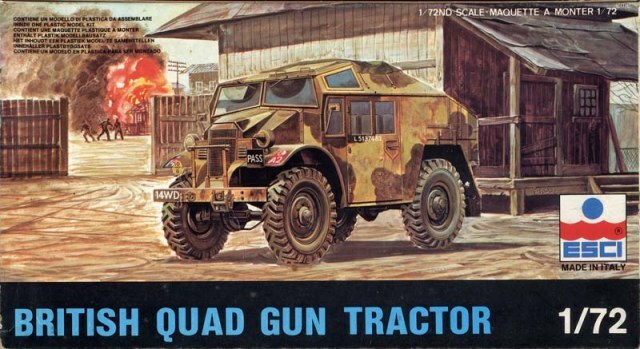 I think on the whole I prefer the Revell one. A nice and clear artwork. As a curiosity, the men drawn are different to the figures, as the officer wears a helmet and there are more shirtless fellows. The same with background. Is it 10 times better, or it is just me? And now the Humbrol, which is just the model in a diorama. They have got a nice shading of the desert, better than my model. But I think that showing the model normally doesn't attract a buyer as much as a good artwork. 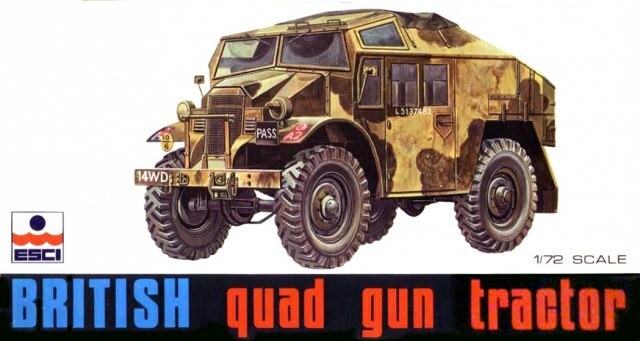 One of the curious things is that this kit is a scaled down Tamiya kit. I don't know to what extent Esci did this, I am still quite puzzled. How do I know? Obviously, there isn't the same exact parts, but everything looks built the same way, and the figures are exact copies. I suppose Esci had permission from Tamiya. I would say that, maybe except the wheels, everything is scaled down. 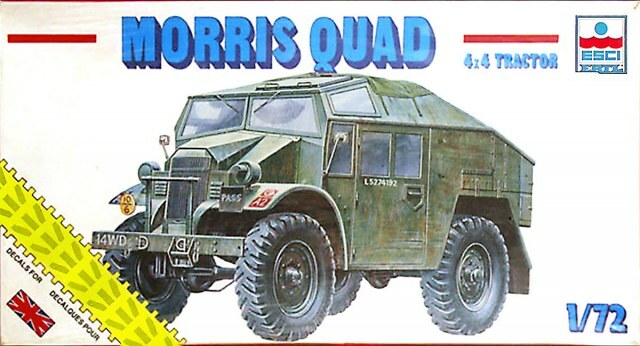 I don't have the model of the Morris Quad, but probably it is a scale down too. 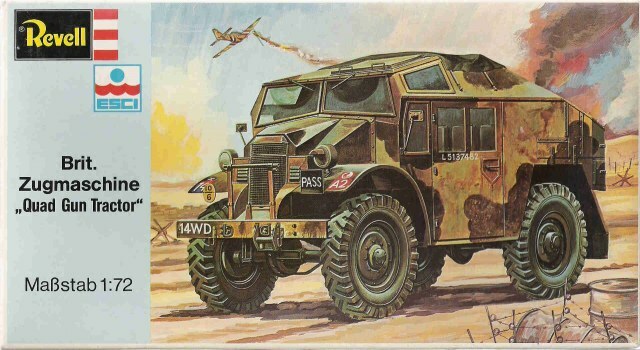 Other kits such as the Fiat Ansaldo is also a scale down (this time from Italeri) (at least, judging by the driver and hull construction). Were all Esci kits scaled down from other manufacturers? Did they ask for permission? I don't have the answer, but it gives you something to think about. Returning to the kit, it has nice detail, and it is easy to build. Probably better than the average Esci. Things fit very properly, and the details are well done. The only difference between this kti and the Esci kits is the inclusion of a clear sheet of transparent plastic to make yourself the glass of the Quad. 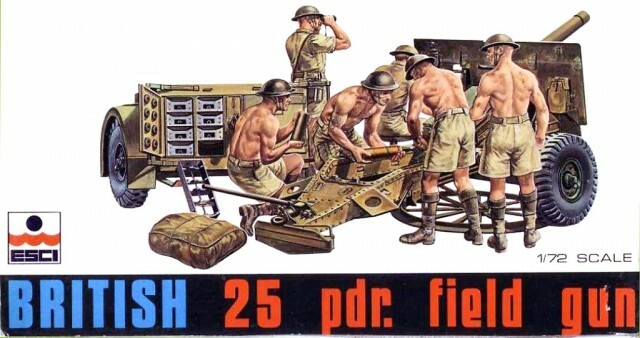 6 crew and plenty of ammunition boxes are more or less the maximum you can ask. 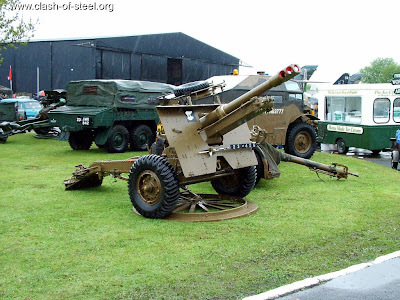 Originally, as the cannon was sold separately, it was absolutely needed to add an extra, but now with the lorry it gives a very high score. The back of the box gives you more or less everything you can do, except the all green one. 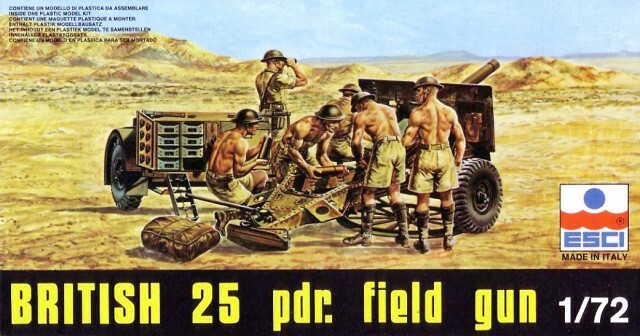 But if you paint it green, the men without shirts will look a bit strange in the middle of France :) , and you will have to get another crew. 10 € for a lorry and a cannon, well done and with 6 crew, it is a fantastic price. 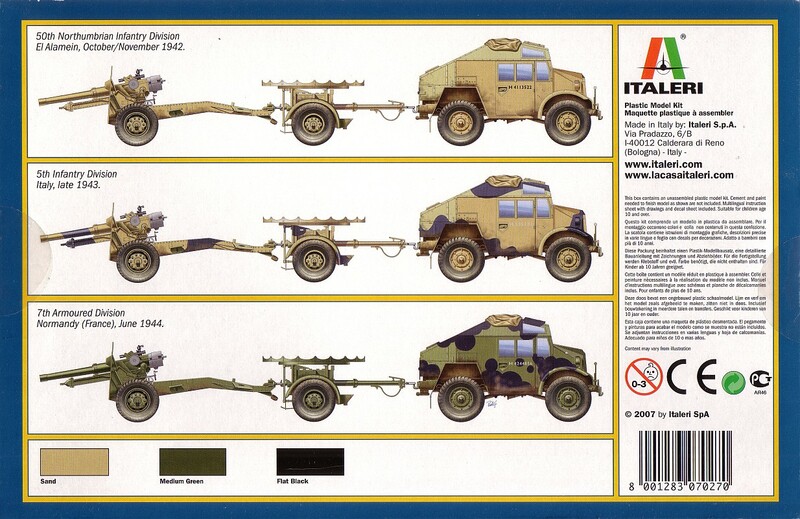 Ok, it maybe is an old model, but all the same Italeri charges more or less the same for one vehicle without crew nor cannon, as old as this one.